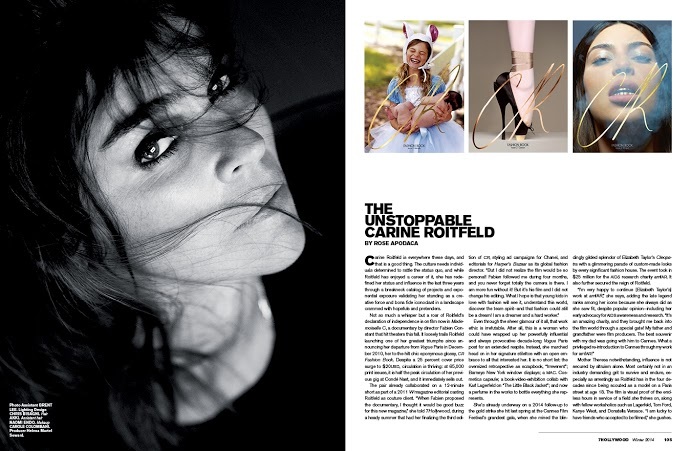 On the sky-high heels of a documentary, the third issue of her eponymous magazine, a global editorial directorship, raising millions for AIDS research, advertising campaigns, the implausible state of grandmotherhood and now nose-deep in the creation of a signature scent, Carine Roitfeld proves that giving up the world of Vogue Paris gained her the keys to rule the fashion universe. 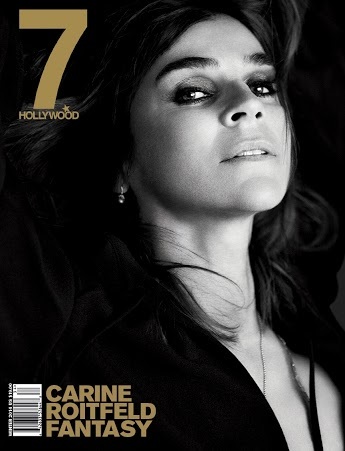 Carine Roitfeld is everywhere these days, and that is a good thing. The culture needs individuals determined to rattle the status quo, and while Roitfeld has enjoyed a career of it, she has redefined her status and influence in the last three years through a breakneck catalog of projects and an exponential exposure validating her prevailing standing as a creative force and bona fide iconoclast in a landscape crammed with hopefuls and pretenders. Not so much a whisper but a roar of Roitfeld’s declaration of independence is on film now in Mademoiselle C, a feature documentary by director Fabien Constant that hit theaters this fall. It loosely trails Roitfeld launching one of her greatest triumphs since announcing her departure from Vogue Paris in December 2010, her to-the-hilt chic eponymous glossy, CR. Despite a 25 percent cover price increase to $20USD, circulation is robust and thriving: at 65,000 print issues it is half of the peak circulation of her previous gig at Conde Nast and it immediately sells out. Even through the sheer glamour of it all, that work ethic is irrefutable. After all, this is a woman who could have wrapped up her powerfully influential and always provocative decade-long Vogue Paris post for an extended respite. Instead, she marched head on in her signature stilettos, with an open embrace to all that interested her. It is no short list: the oversized retrospective as scrapbook, Irreverent; Barneys New York window displays; a M.A.C. Cosmetics capsule; a book-video-exhibition collab with Karl Lagerfeld on The Little Black Jacket; now a perfume in the works to bottle everything she represents. She’s already underway on a 2014 follow up to the gold hit she struck last Spring at the Cannes Film Festival’s grandest gala, when she mined the blindingly gilded splendor of Elizabeth Taylor’s Cleopatra with a glimmering parade of custom-made looks by every significant fashion house. The event took in $25 million for the AIDS research charity amfAR. It also further secured the reign of Roitfeld. This isn’t so much hyperbole. Consider New York Fashion Week in September: at her side during a nightly celebration for one or another of her latest projects, steadfastly stood Christian Restoin, her other half for more than three decades. They never legally married, she has said, so they would never have to divorce. Also in tow during that fashion week circus was their two children. The entire clan took one evening off from feting mother to celebrate a Peter Lindbergh showcase by son Vladimir Restoin Roitfeld, who has been making his mark as an art dealer and curator since graduating from the School of Cinematic Arts at the University of Southern California in 2007. Four years older at 33 is sister Julia Restoin Roitfeld, an equally beautiful creature who capped her studies at New York’s Parsons School of Design in 2006 by becoming the face of Tom Ford’s Black Orchid. (As friend and muse to Ford, Carine played a key function during his phenomenally successful stints Gucci and Yves Saint Laurent). Like her mother, Julia has a penchant for a smoky eye and career hyphenation, having worked as model, consultant, lingerie designer and now graphic designer. With her longtime partner, the Swedish model Robert Konjic, Julia gave birth in May 2012 to Romy Nicole, and, it turns out, a rejuvenated outlook for grandmama. It also became an unintended central plot for the documentary. “For the first issue [of CR], I was obsessed with my daughter having a baby,” she says, having zeroed in on the theme of “rebirth” for the inaugural issue. She wasn’t alone in being captivated by all a baby represents. One of the film’s most ballyhooed moments is Lagerfeld pushing the pram.